There are two AJH modules on review today. First up is the Sonic XV, which is based around an early 24dB diode filter from the Musonics Sonic V. It was designed by ex-Moog employee Gene Zumchak and, according to Gordon Reid’s March 2002 Retrozone article, the filter also found its way into early Moog Sonic Sixes (after Musonics bought Bob’s ailing company). Diodes or not, a distinct Moog flavour leaks through, but this filter offers an alternative take on traditional low-pass operation. It incorporates waveshaping of both the input signal and the resonance; plus, as icing on the cake, it provides simultaneous band-pass and one-pole (6dB) outputs to accompany the main four-pole output. Resonance performs its typical bass-lightening function, which is sometimes viewed as a criticism, but I’ve always found it useful. It’s even more versatile here because you can fine-tune the resonance’s level and tonality. Via the Res Mix control you set how much of the resonance is routed through its waveshaper, from none to 100 percent. The tone is then adjusted using the Res Wave drive knob, or via CV. It’s rare to have this degree of control over resonance, which here can stretch from edgy, shrill and biting to fuzzy, pure and wet. Even if you aren’t using the waveshaper, CV-controlled resonance amount is always welcome. When self-oscillating, you can play the resulting whistle from the filter’s 1V/oct input. Any adjustments to the Res Mix and Res Wave controls invariably throw the tuning to the wind but I was usually able to get accurate tracking over approximately three octaves. If that were the full story, this would be a nice alternative filter to grace any system, but AJH added waveshaping of the input signal too. To best exploit this circuitry, you’re advised to use simpler waveforms — eg. triangles and sines — which, ordinarily, wouldn’t be the first choice to feed a low-pass filter! As with the Resonance Waveshaper, a combination of mix and drive controls delivers variations in timbre, ie. harmonics are added rather than filtered off. This forces a humble triangle wave to produce tones ranging from bright and sync-like to something approaching a dirty form of PWM when modulation is applied to the drive amount. The three-way Bias switch offers different flavours of waveshaping, which range from subtle to a fairly significant bass boost. Admittedly the effects aren’t always predictable (especially if you use more complex waveforms as input) and they’re highly susceptible to small changes in the Wave Drive. Regardless, it’s a great waveshaper and a fine supplement to an already-impressive vintage filter. AJH Synth Ring SM. Size: 14hp. Current: +12V rail = 55mA; -12V rail = 50mA. Available in silver or black.The second AJH module, the discrete transistor-based Ring SM, isn’t merely a ring modulator. It can double as a five-input mixer and incorporates a pair of sub oscillator generators too, rendering it genuinely multi-functional. 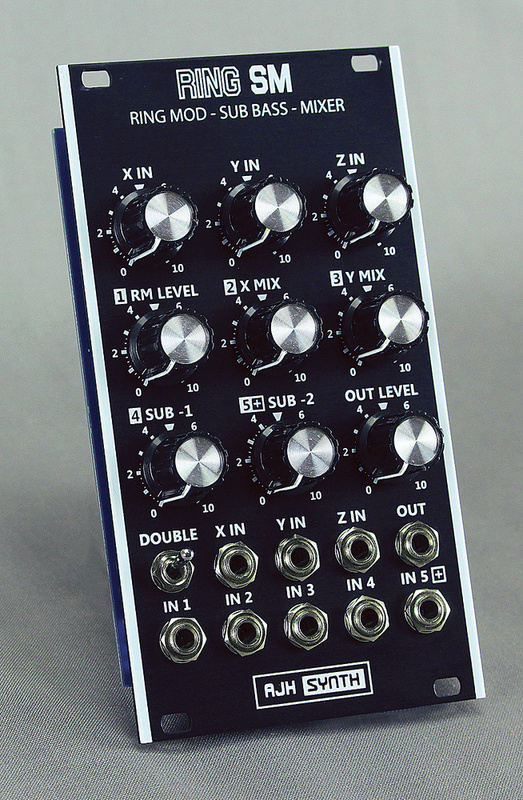 Expanding its coolness to Spinal Tap levels, there are three inputs — X, Y and Z — one more than a regular ring mod! Ring modulators produce a signal that contains both the sum and the difference of the source frequencies. In this module, a trick is available using a single source at the X input. Flip the Frequency Double switch to its uppermost position and X will be added to itself and to zero, hence the doubling effect. As with all ring modulators, the most instantly understandable results are achieved when the input waveforms are relatively pure — sine waves are perfect. Before the DX7 came along in the ’80s, this was the go-to means of achieving bell-like tones with a synthesizer, but ring modulation is capable of much more. Classic sounds such as the Dalek voice are achieved by combining voice input (or recording) with a low-frequency sine wave (around 30 to 40 Hz). Similarly, much of Bebe and Louis Barron’s Forbidden Planet soundtrack is sourced in ring modulation, although the circuits were usually in their death throes. 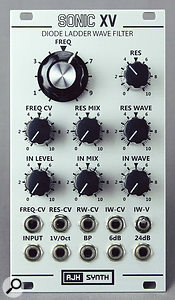 Having level controls for the inputs already seems like a luxury, but input Z is slightly different to its mix partner, Y. It’s described as having a “more resonant character”, which is most easily demonstrated by comparing the effect of a square-wave LFO fed into both Y and Z in succession; Z has a marked softening and blurring effect. This plus the level tweaking and discrete circuitry add up to a far more organic implementation of ring modulation than usual. Additionally, the X input generates two sub basses, at one and two octaves down respectively. Rather than the traditional divide-down square waves, these are sines, although they become more and more impure the deeper you go. In practice, it’s a superior way of adding presence to a single oscillator input without making too many tonal changes. If you feed the X input with complex waveforms — eg. those of a Studio Electronics Quadnic — the sub oscillators struggle to track properly, or else they track some notes in the scale but have a fit when presented with others. I like this a lot! If you make a connection at the mixer’s first input ‘In 1’, the ring modulator is deactivated. Up to five channels of audio or CV can be accommodated, which is particularly helpful for those times ring modulation isn’t required. Input 5 is designated as a ‘hot’ input and features rather tasty clipping and distortion. In fact, all the inputs offer analogue distortion beyond their ‘9’ setting, even if you’re using just a single channel. Once upon a time, a ring modulator would have been found in most modular systems, but with today’s much wider choice of modules, they’re in danger of falling by the wayside. It’s therefore a canny idea to blend a versatile example of the species with a mixer and sub-oscillator generator. A winner! Silver £245 each, Black £260 each. Sonic XV $369, Ring SM $389.